"It's puzzling. I looked at a few pictures around (area) and couldn't find anything to explain it. Very puzzling! These are huge boulders. There are no indications of any outcrops that could shed such boulders." Scattered 80-foot dark boulders - from where? Nilosyrtis Mensae Valleys, mid-Martian latitude. 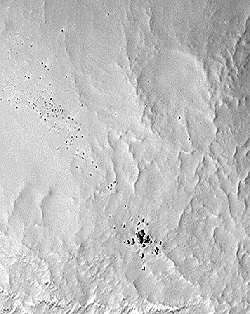 High resolution image is 3 kilometers wide by 4.9 kilometers vertical (1.9 miles by 3 miles) taken on February 14, 2001 by the Red Rover Goes to Mars International Student Training Mission. Image courtesy of NASA/JPL/Malin Space Sciences Systems. February 25, 2001 Carlsbad, California - On February 14 while NASA's Near spacecraft was making its historic landing on the Eros asteroid between Mars and Jupiter, a camera on the Mars Global Surveyor orbiting the red planet was under the guidance of an international group of four girls and five boys aged 10 to 15 known as the Red Rover Goes to Mars team.